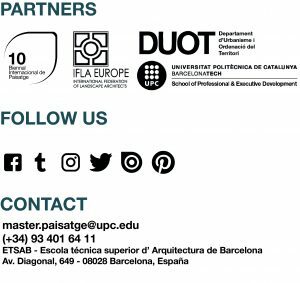 MAIN MODULES – Master in Landscape Architecture Barcelona – Universitat Politècnica de Catalunya – 35ª EDITION. The MLAB‘s programme is structured around 4 main modules (A. Public space, B. Green systems, C. Water sysytems and D. Tourism), 3 international intensive courses (I. The green public space, II. Water and tourism, III. Remaking landscapes) and a set of theoretical courses (Contemporary landscape projects’ critique and the Master final project). From the disciplinary knowledge of more than 150 years of design models related with the modern history of public space and after 25 years of academic experience on present day issues related to landscape, the studio investigates free space, through a contemporary prism that goes beyond urban design typologies, in order to incorporate global notions and strategies about its essence. Dissertation: The students will have to produce a research project or thesis of a critical nature and showing a holistic vision concerning all the knowledge assimilated throughout the master and specifically based on the knowledge acquired during the work experience stage.